click on plates for more info. 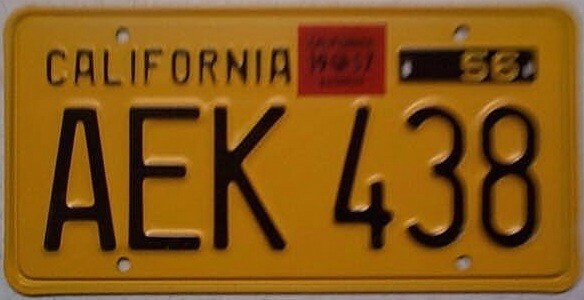 1920 California Plate. Black on white, issued in pairs. Measures 13 7/8” x 4 7/8”. 1921 California Plate. Black on yellow, issued in pairs. Measures 13 7/8” x 4 7/8”. 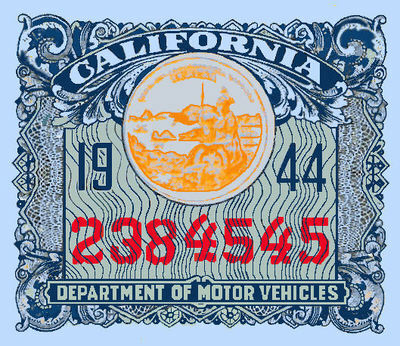 1922 California Plate. Blue on white, issued in pairs. Measures 13 7/8” x 4 7/8”. 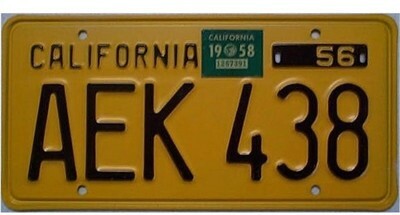 1929 California Plate. Orange on Black, Issued in pairs. Measure 14” x 6 1/8”. 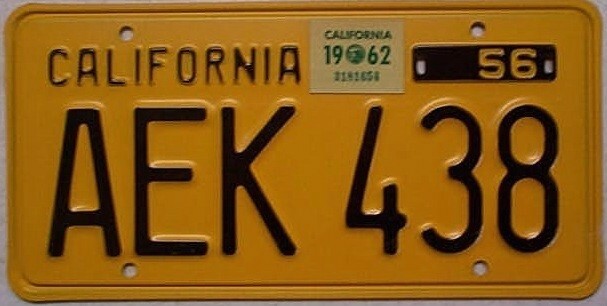 1939 California Plate. Yellow on blue, Issued in pairs. Measure 14” x 6 1/8”. 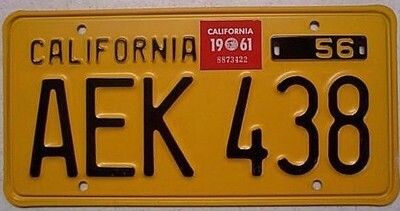 Embossed "California World's Fair"
1942 California Plate Mustard yellow on Black Issued in pairs, with 1943 V tabs red on white. Measure 13 7/8” x 6 1/8” with rounded corners. Steel lithographed tab, white background with red letter “V” for use on the upperright corner of 1941 and 1942 plates. 1947 California Plate. Black on yellow, issued in pairs. Measured 13 7/8” x 6 1/8” with rounded corners. Plates were embossed steel or aluminum. 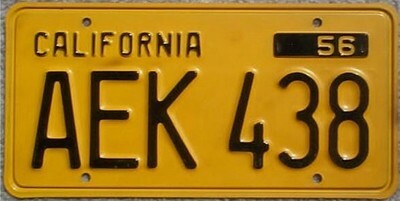 1947 California Plate, Black on yellow with Aluminum tab, natural background with a red number “48” for use on the upper-right corners of 1947 plates, issued in pairs. Measured 13 7/8” x 6 1/8” with rounded corners. Plates were embossed steel or aluminum. 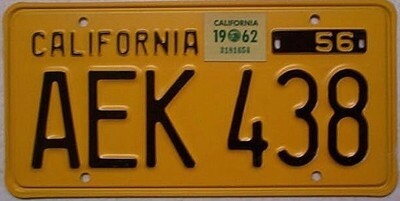 1947 California Plate, Black on yellow with Aluminum tab, natural background with a black number “49” for use on the upper-right corners of 1947 plates, issued in pairs. Measured 13 7/8” x 6 1/8” with rounded corners. Plates were embossed steel or aluminum. 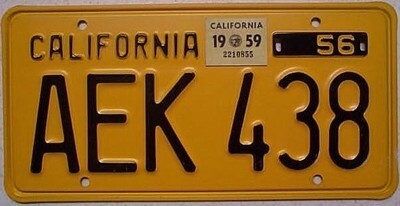 1947 California Plate, Black on yellow with Aluminum tab, natural background with a red number “50” for use on the upper-right corners of 1947 plates, issued in pairs. Measured 13 7/8” x 6 1/8” with rounded corners. Plates were embossed steel or aluminum. 1951 California Plate. Yellow on Black, issued in pairs. Measured 13 7/8” x 6 1/8” with rounded corners. 1952 California Plate. Yellow on Black, issued in pairs. Measured 13 7/8” x 6 1/8” with rounded corners. 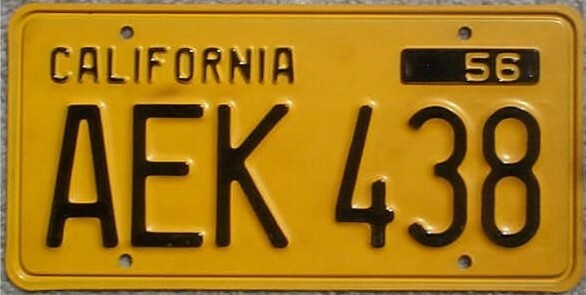 Steel tab, chrome yellow background with a black number “52” for use on lower-right corner of 1951 plates.